Had a look out in the undergrowth after recent stormy and wet weather and was so happy to find a summery pair, and it seemed as if each of them looked me straight in the eye! Were they aware of my presence? I like to think so……. Very nice macros. Thank you for sharing. Beautiful photos! It's always so nice to see the helpful little critters out in the garden (especially the pretty ones)! Great shots of the butterfly and the ladybug! I like that you not only pay attention to the plants, but to all inhabitants of your garden! To tell the truth I am always distracted by anything but the gardening, love the results am lazy about the efforts. Yes the butterflies are usually hard to capture, that's why I was so happy to find three on one plant. Like buses, they all arrived at the one time. Thanks for all your encouraging comments! Beautiful captures of the butterfly and ladybug/ladybird!! Great photography. Got to love those macro lenses. 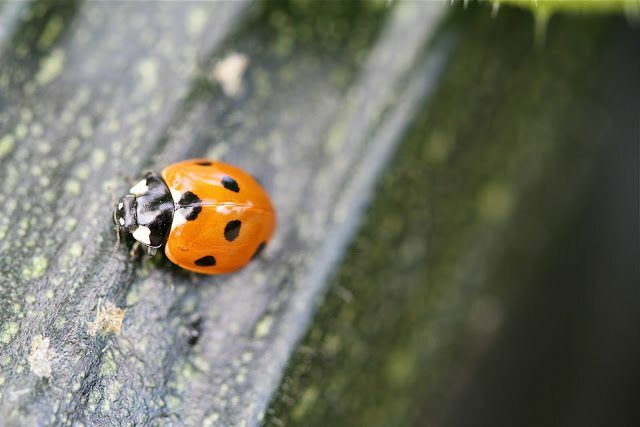 You captured the lady bug beautifully – almost looks like she could say hello. That is one hairy butterfly! Beautiful captures and bug portraiture.